Back in the day, people avoided anything unpretty when it comes to their fashion choices. Now, ugly is the new cool. Case in point: fugly sandals (think Birkenstocks), not-so-flattering pants (hello, khaki), and of course, fanny packs. Another "nasty" trend on the rise? Ugly sneaks! Want to jump into the cool bandwagon but not quite sure how? We're here to help. Channel street style and wear your cool sneaks with an oversized top. Throw in a pastel jumper to add a femme touch to your look. 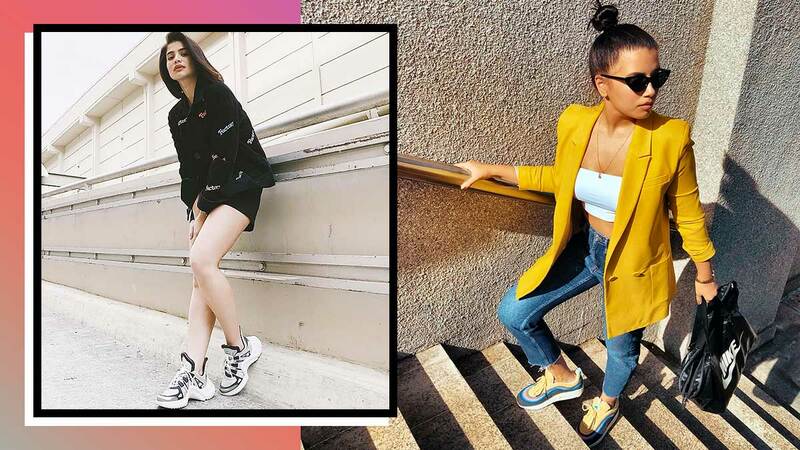 Take your cue from Nadine Lustre and opt for a clean white version of the ugly sneakers. Wear it with a preppy plaid dress and finish your look with an oversized jacket to score extra cool points. Who said that ugly sneaks are for the streets only? Cop fashion blogger Aimee Song’s dramatic look and wear yours with your evening frock. One word: swag. Ditch your favorite old blue jeans and wear a pair of dressy trousers instead. Opt for an all-black OOTD and make your sneakers take center stage. Or go classy in all-white like Bella Hadid’s fresh look. Go bold and opt for a pair in bright yellow. Throw on a strong blazer that matches your fancy footwear to add some sleekness to your look while still keeping up with the fun. When in doubt, a cool leather jacket and sunglasses will always do the trick of dressing up any outfit. Yes, even a look that involves a pair of ugly sneakers. Swap your heels for pink sneaks, throw on your fuzziest jacket, and you’re all set! The ugly trend is all about embracing eccentricity. Play with oversized pieces, colors, and plaid patterns for a cool comfy look that’s still 100% dressy.